Ohio State Quarters are the 17th variety in a series of fifty design changes over a ten year period from 1999 to 2008. This Quarter was released into circulation on March 11, 2002. Ohio is known as the birthplace of aviation pioneers. An outline of the state is pictured on the reverse as well as an astronaut and an early aircraft. Very well known astronauts such as John Glenn, who was the first man in space, and Neil Armstrong, first man to walk on the moon were born there. Orville Wright, who was one of the first men to conquer the air, was also born in Ohio. 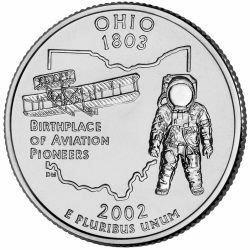 The reverse of the coin bears the inscriptions "OHIO 1803", "BIRTHPLACE OF AVIATION PIONEERS", and "E PLURIBUS UNUM" along with the date of 2002.